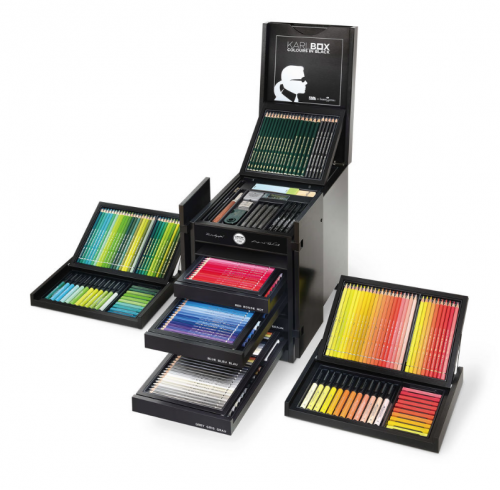 If your a creative and in the need of or want the ultimate pencil, pen, marker kit then this find is all you. Karl Lagerfeld and Faber-Castell got together to create this limited-edition collection of high end drawing tools and artists’ supplies. Anchored in simple elegance, the KARLBOX contains 350 fine quality art tools for drawing and painting, all in a sleek black box that has been designed by Karl Lagerfeld. Produced with exemplary craftsmanship, its wooden frame resembles a Chinese wedding cabinet: inside, drawers store the art supplies, sorted by color shades, all of which have been personally selected by Karl Lagerfeld and symbolize the synergy between fashion, art and design. The individual drawers are removable in order to set them up for creative work. Every one-of-a-kind box has a serial number and certificate of authenticity, making each completely unique and unmistakable. So now go HERE to get this in your life of bless a creative with a truly special kit.